We are proud that the geologic wealth of our lands, which give a so particular and complex nature to our vineyards and thus to our wines, is recognized by this symbolic world institution that is the UNESCO. 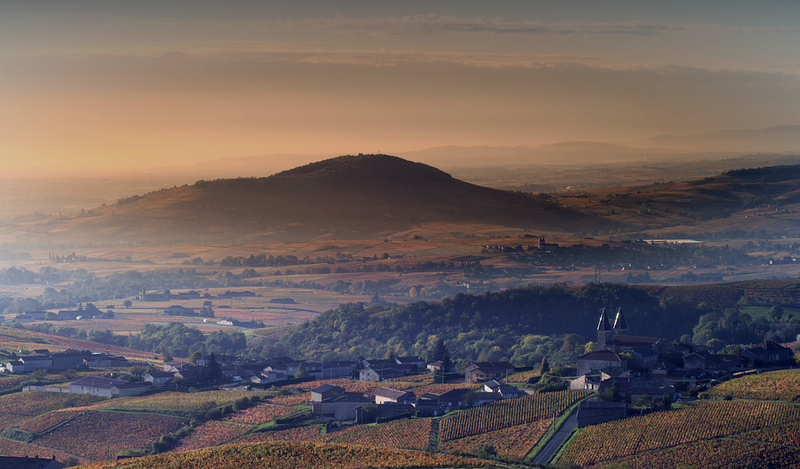 It is the strong distinction which highlights the history, hundred million years old, and is going to allow the conservation of the geological wealth, the education and the raising awareness to the environment of a tourism more and more bigger in Beaujolais. Indeed we were really happy receive Bill Nanson from Burgundy Report last month. You can find the tasting comments on the link below.. Enjoy! 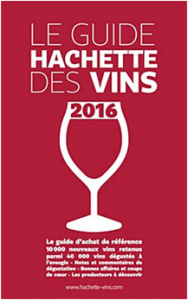 The French wine specialised magasine “Revue du vin de France” has selected our 2016 Tradition Cuvée as one of the best wine of the year. 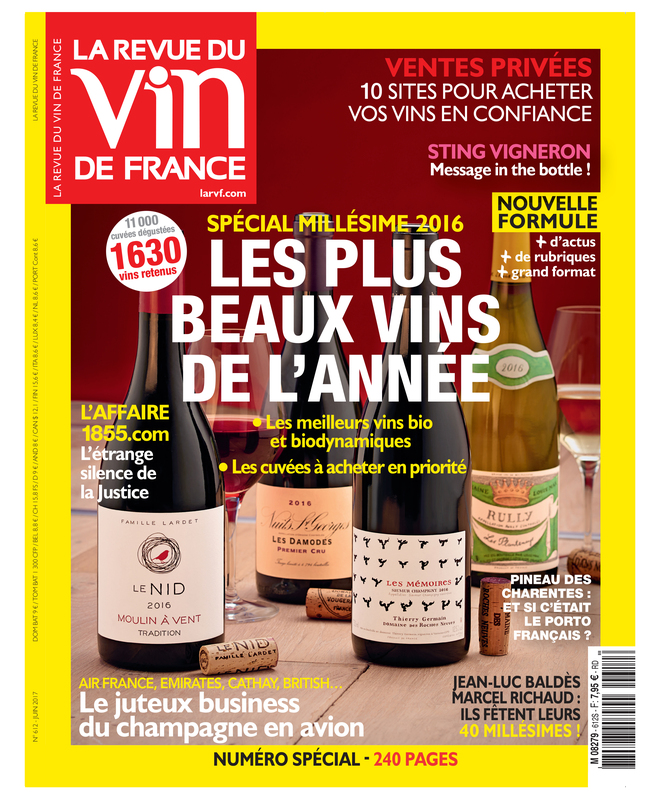 We are glad Moulin à Vent to be part of the best Terroir and proud Maison Le Nid to be on the front page… Gamayzing!! For the second time in only 2 participations, we were proud to have gained the ultimate recognition: the Gold Medal for our Cuvée Tradition 2015 which will be available for sale at th end of 2016. 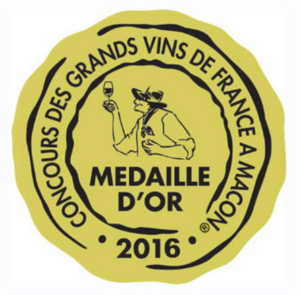 The “Concours des Grands Vins de France de Macon 2015‟ (Macon Great Wine Challenge 2015) is the most prestigious wine competition in France. Since its creation in 1954, it has gained an important popularity and notoriety with more than 11,000 samples competing against each other each year. 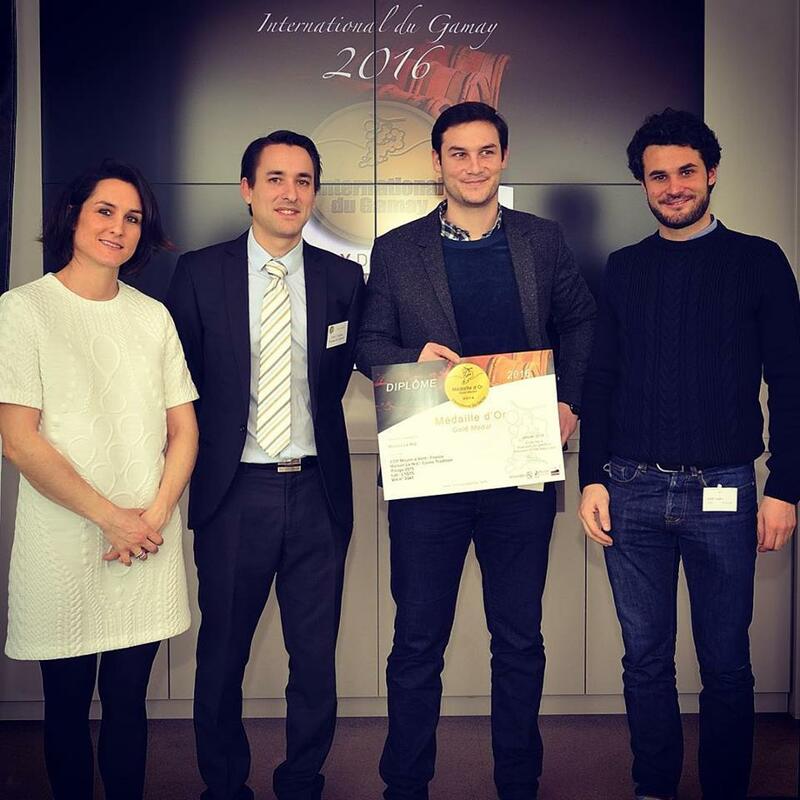 The Lyon International Challenge 2016 through the support of its partners “Les Toques Blanches Lyonnaises”, “Global Wine and Spirits” and the Sommelier Association of Lyon and Rhône-Alpes has gained strong notoriety. The enthusiasm does not disappoint with around 5800 samples tasted and twenty-eight countries represented. 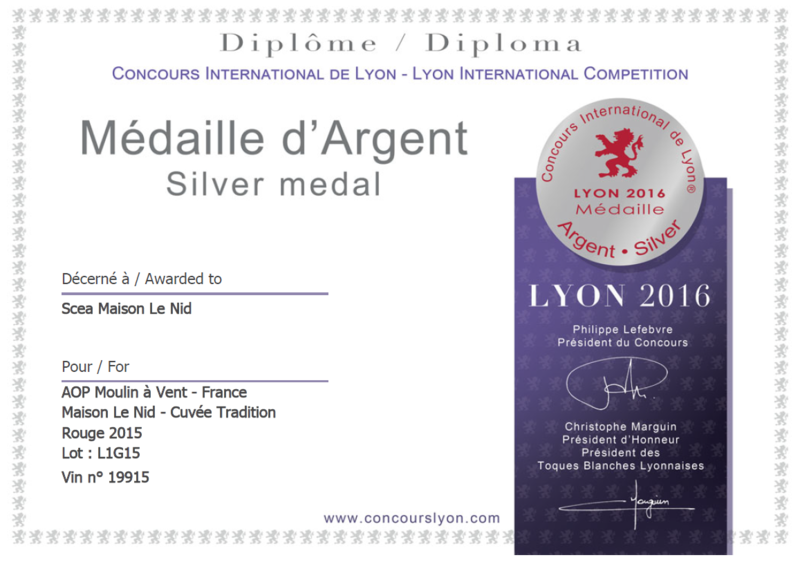 In 2016, la Maison Nid was awarded the Silver Medal for its Cuvée Tradition 2015 which will be available for sale at the end of 2016. 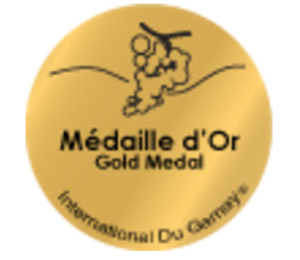 Our first Gold Medal at the International Gamay Award after winning a Silver Medal last year. We are proud to receive such a positive feedback from wine experts who had to choose between 600 different Gamay wines. 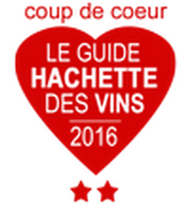 We are happy to announce that our first vintage Rochegrés 2013 has been elected “Coup de cœur” of Hachette Wine Guide 2016 and received 2 stars described as a remarkable wine. Maison Le Nid is glad to be the “Coup de Coeur” of the prestigious French “L’Express” magasine in its September issue dedicated to the 2015 French wine vintage. The author is highlighting the French Terroirs with high potential, focusing on the new generation of wine makers in Moulin-a-Vent using Maison Le Nid as a credential. The article reminds the exceptional Terroir history and compares Moulin-a-Vent quality to its Burgundy cousin. The prestigious “Revue du Vin de France‟ wrote in their “Top 1500 wines of the year‟ (No. 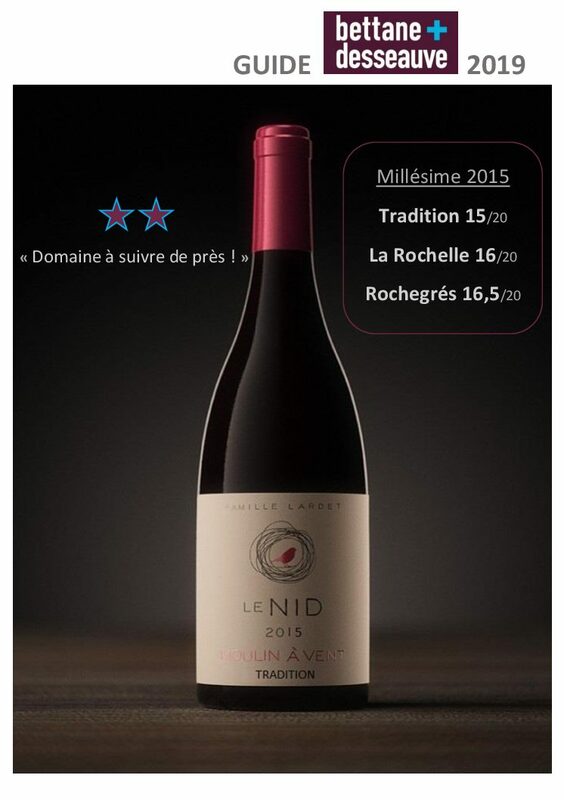 592, June 2015) a lovely article on la Maison Le Nid, naming it “Coup de Coeur‟ of the 2014 vintage. Our “La Rochelle‟ plot selection received a score of 18-19 out of 20. This journal that showcases the wines of Beaujolais wrote in its dossier “Crus of Beaujolais” (No. 14 May 2015) an article highlighting the exceptional domaine and new methods of wine-making and growing at La Maison Le Nid. Our “La Rochelle” plot selection and our “Rochegrés” plot selection each received a score of 17 out of 20. Our Cuvée Tradition received a score of 15.5 out of 20. 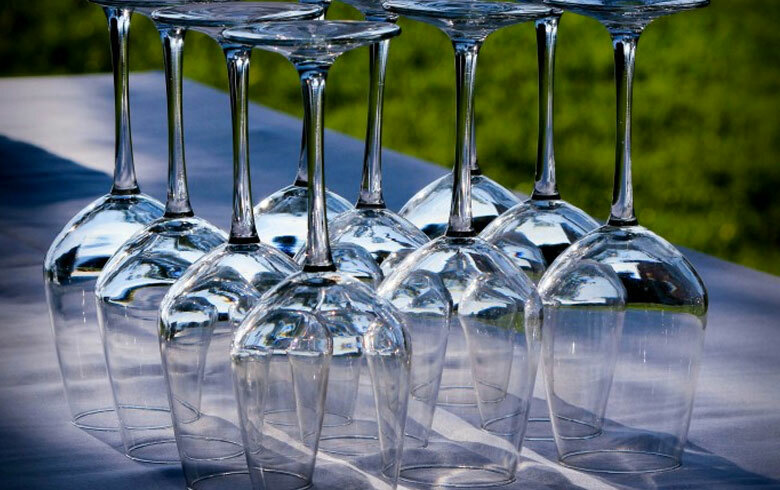 Decanter World Wine Awards (DWWA) is the largest and most influential wine competition in the world. Judged by the world‟s top wine experts, the DWWA is renowned the world-over for its rigorous selection process. 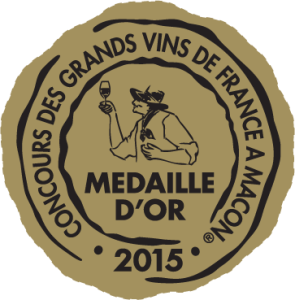 In 2015, La Maison Le Nid was awarded a Bronze Medal for our “La Rochelle” plot selection 2013 and two recommendations for our Cuvée Tradition and “Rochegrés” plot selection 2013. As such, all our wines received awards. These international prizes for a first outing in such a competition are the fruits of three years‟ hard work. These awards encourage us to continue on our journey of taste and respect for our grapes and our Terroir. 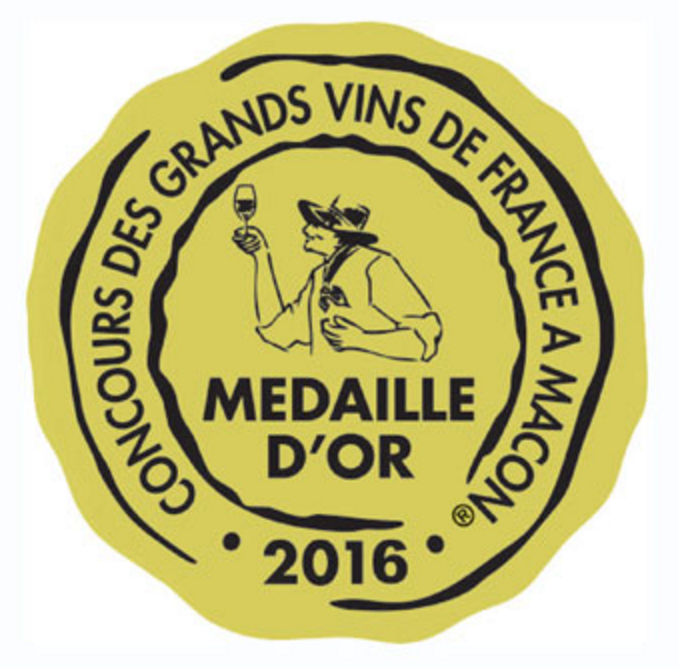 The „Concours des Grands Vins de France de Macon 2015‟ (Macon Great Wine Challenge 2015) is the most prestigious wine competition in France. Since its creation in 1954, it has gained an important popularity and notoriety with more than 11,000 samples competing against each other each year. In 2015, we were proud to have gained the ultimate recognition, during our first outing, of the Gold Medal for our “La Rochelle” plot selection 2013. Lyon is well known as a capital of taste, so it was a natural choice that the city should welcome a selection of the world‟s best wines. 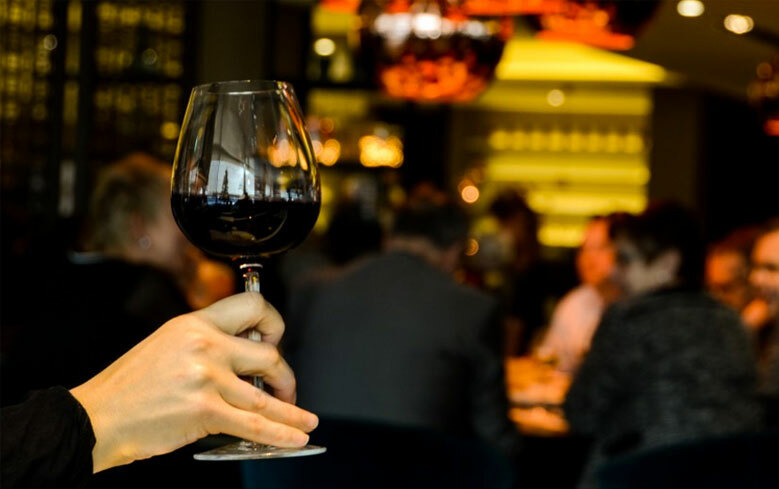 The Lyon International Challenge 2015 through the support of its partners „Les Toques Blanches Lyonnaises”, “Global Wine and Spirits” and the Sommelier Association of Lyon and Rhône-Alpes has gained strong notoriety. The enthusiasm does not disappoint with around 3500 samples tasted and twenty-two countries represented. In 2015, under the presidency of Denis Verneau, Chief Sommelier at the double Michelin-starred “Mère Brazier” in Lyon, la Maison Nid was awarded the Gold Medal for its Cuvée Tradition 2013. In a number of countries, the main criterion for the selection of a wine is its grape. The objectives of the Gamay International Wine Challenge are simple: to select the best Gamay in the world and to show off the qualities, diversity and characteristics of this incredible grape variety; a wine which is fruity, easy drinking, slightly tannic, complex and gets better with age. Each year, a panel of one-hundred and thirty tasters, made up of wine experts and professionals judge six hundred samples. 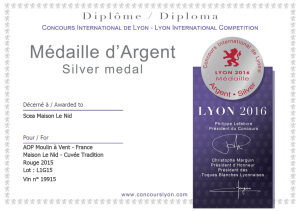 In 2015, la Maison Le Nid was awarded, to our great delight, a Silver Medal for our Cuvée Tradition 2013.